Shares in bookstore chain Ottakar's have plunged 14% after a takeover offer for the firm from HMV was referred to the Competition Commission. HMV, which owns rival bookstore group Waterstone's, said it would defend its case. Its shares were up 1%. 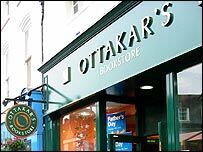 A number of independent book retailers have voiced opposition to the takeover, which values Ottakar's at £96.4m. They have argued that a merged HMV and Ottakar's would be too strong, something HMV denies. "HMV Group remains of the belief that a combination of Waterstone's and Ottakar's will not give rise to any substantial lessening of competition," HMV said in a statement. The Office of Fair Trading said it had received an "unusually high level of consumer complaints" that the benefits of competition would be lost by a combination of the two chains. Ottakar's said it was disappointed with the decision and would cooperate with the probe. The Forum of Private Business (FPB), which represents a number of small stores, said the Office of Fair Trading's decision to refer the case was victory for small firms over the retail giants. "There can now be a thorough investigation into this deal and the anti-competitive share of the market it would give HMV," said the FPB's chief executive Nick Goulding. HMV's 440p-per-share offer was accepted by Ottakar's in September. It trumped an existing bid by the chain's management, which had initially been backed by Ottakar's independent directors. Ottakar's was founded in 1987 and today has 137 stores across the UK. If HMV's bid is successful, the merged bookstore chain would control 23% of the UK market.